An Advent tree was put up for the first time in 1846 in a refuge for boys run by the “Rheinische Pastoralgehülfenanstalt” in Duisburg. A fir tree planted in a pot was put up without any lights or decorations on the first day of Advent. A biblical verse, written on a note by one of the children, was read out loud to all the children. This was then attached to the tree together with a candle. All the children had to learn the verse by heart by the next day. On the second day the first candle was lit and the second verse was read out loud, etc. On Christmas Eve this Advent tree stood together with the Christmas tree in the same room. Over time different versions of the notes came onto the market: as cardboard stars, cardboard cards and since 1895 in the form of printed vine leaves. 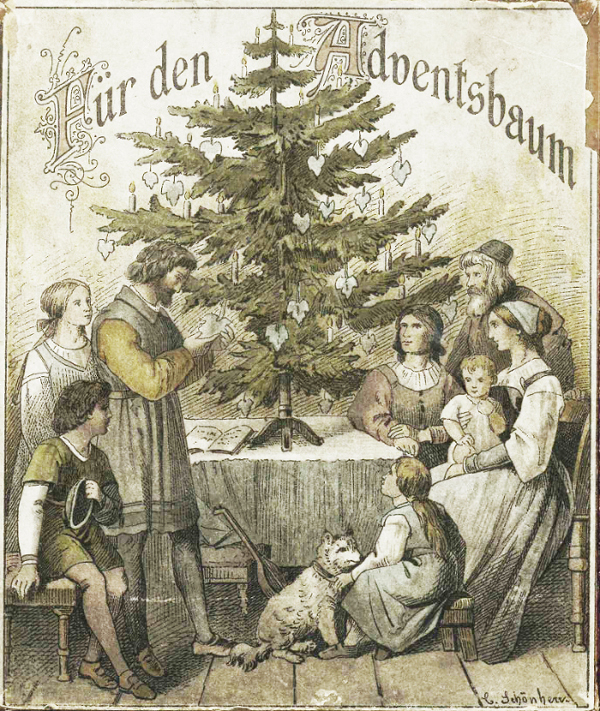 This new collection of verses was created by Carl Gottlob Schönherr (1824-1906) for the Diakonissenanstalt Luisenstift hospital in Lößnitz (near Meissen) with the title “For the Advent Tree”. The hanging notes were still being sold up to about 1940 and had been spread as far as the Netherlands, France, Constantinople, Russia, East India and North America by pupils, teachers and staff from protestant institutions. There are prophetic oracles on the one side of the vine leaves and scenic illustrations for the prophecies on the other side.